It’s not just that they attained great heights on the field during the 1970s; there’s also something iconic about them, something that connects to me on a vital level, the mere mention of the name strong enough to make me feel the flicker of the kind of engagement with the world that I felt most strongly as a child. That engagement waned as I grew older, but it always flared up again whenever I considered another player who has made numerous appearances on this site: Dock Ellis. Something about the late great Dock always brings back the primary colors of my childhood, brings back a feeling like anything could happen. He was an adventurous soul, something recently attested to in brilliant fashion by No Mas and artist James Blagden, who created the animated video below that tells, with the help of Dock Ellis himself, one of baseball’s greatest stories. I would have featured a Dock Ellis card today, but it seems that I’ve already exhausted my collection of its Dock Ellis cards. 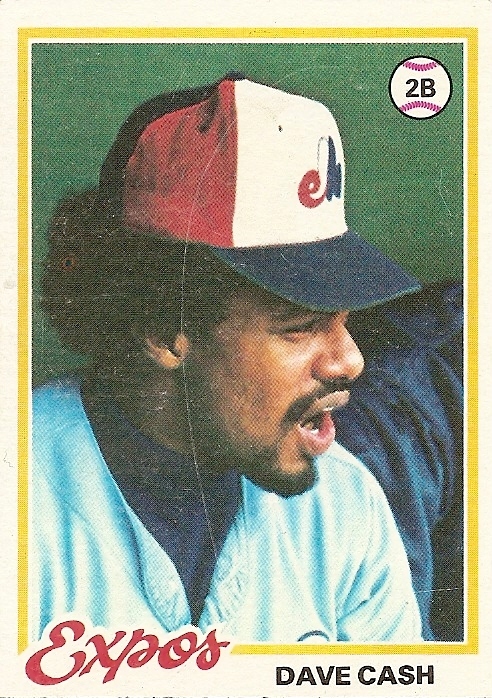 Fortunately, I have a 1978 card that shows Dave Cash yapping away on the Montreal Expos bench, something he apparently did since he entered the league a few years earlier as a teammate of Dock Ellis on the Pirates. Cash plays a small but key part of Dock’s story, jabbering in a mocking way at the pitcher throughout his historic effort, and in doing so stridently flaunting one of the most strongly held superstitions in a game rife with superstitions. In Dock’s retelling, Cash comes off as a likable, extroverted fellow iconoclast, someone who may actually have defused the building tension throughout the game by talking about the elephant in the room. If something is happening, why not talk about what’s happening? And if something has happened, why not tell the tale? Dock Ellis told the tale, and now, thanks to No Mas, the tale is being experienced by a whole lot of people in a great, new way. b) entrusting my psychic health to the stable if unremarkable fortunes of a team that had never won anything, rarely threatened to win anything, and, as it turned out, never would win anything before in essence ceasing to exist. Painless, in a way, or so it seemed. “He is going, he realizes. “He is going, and he will not be coming back as Brad. “He must try to at least retain this feeling of pity. If he can, whoever he becomes will inherit this feeling, and be driven to act on it, and will not, as Brad now sees he has done, waste his life on accumulations, trivia, self-protection, and vanity. “He tries to say his name, but has, apparently, forgotten his name. Anyway, though I rooted peripherally for the Expos, I never did dump the Red Sox to become a full-blown Expos fan. I guess I don’t enjoy changing or disguising my identity. (The idea of having to go to a costume party, for example, fills me with dread.) On the contrary, I think when push comes to shove I go to great lengths to reaffirm that my identity is fixed, that even when things are changing all around me there is a central point that cannot change. It’s probably the fiction to which I hold most tightly. Judging from the look on his face, I think Dave Cash might know what I’m talking about. His expression is a pungently soulful counterpoint to the flat, affectless masks of the chameleon posing as Craig Swan and Carmen Fanzone. He seems acutely and sourly aware of what is happening to him: he is–as I never did–becoming a Montreal Expo before our eyes. Look closely at the unnatural white in his uniform and cap crown, at the unnatural blue on the bill of his cap, and, most especially, at the obvious pen-scribblings on the right half of the M on his cap. 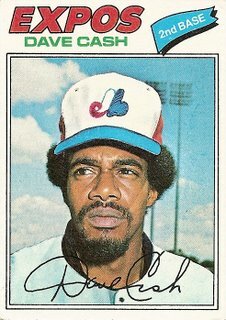 One interpretation of this is that Dave Cash moved from the Phillies to the Expos so close to the beginning of the 1977 season that Topps had to doctor their photo of him in a Phillies uniform. But I see this card as something akin to “Duck Amuck,” the immortal Warner Brothers offering in which an unseen cartoonist keeps erasing the scenery around Daffy Duck and replacing it with completely different scenery. In other words, Dave Cash, against his will, is being transported by a possibly inebriated and/or incompetent employee of the Topps art department from his place as an all-star second-baseman on a division-winning Phillies team to an expansion squad in a foreign country with a suffering exchange rate, where he will waste the remainder of his prime toiling on fraying Astroturf in front of the empty plastic seats of a dome that will echo quietly with muttered Gallic curses that Dave Cash will be able to understand in his bones even though he doesn’t speak a word of French. Why would someone want to be an imposter, to create and inhabit the persona of someone they’re not, to for once take the reigns of ceaseless change? I’m not really sure. But ask Dave Cash. He might know. You are currently browsing the archives for the Dave Cash category.